A small item in today's Geelong Advertiser supplement about an art exhibition down the coast at Fairhaven listed Eddie Warhurst as one of the artists. Well, that's great. 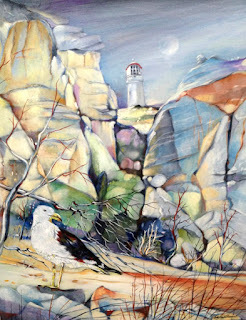 Eddie and his wife Nancye were colleagues when we studied art - was it really about sixty years ago! 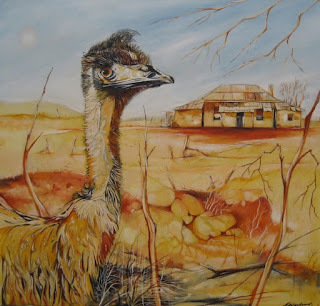 High school art teachers of course - and now in retirement Eddie is doing lovely paintings of birds, animals, the sea - and the Mallee - the place where many of us came from. 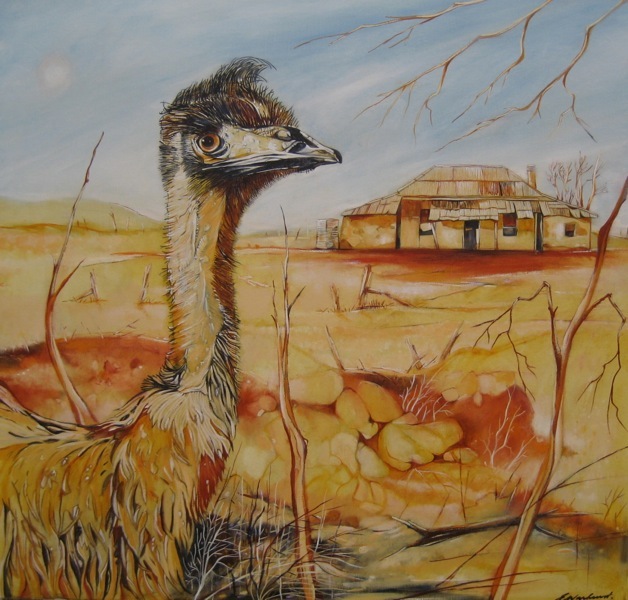 His website shows a great gallery -http://www.eddiewarhurst.com/?page_id=14 and here are two examples. There are several ways of helping to feed neighbours in the Geelong community and here is one I hadn't heard of before. Spare Meals. The story is in the Geelong Advertiser. Spare Meals Geelong founder Tina Taylor. LONG ago, my husband and I scrimped and saved for our house deposit. Despite enormous financial restrictions, we were immensely proud to establish a home we’d one day own. Eating two-minute noodles or baked beans was a way of life. We were warmly welcomed into our new area. As time passed, our cosmopolitan neighbourhood regularly celebrated special events and commiserated during hard times. The strong community network was forged over shared tasty, exotic foods, prepared with love. Our financial struggles made these feasts even more special. Across the road from us lived the most beautiful elderly Italian couple, Antonio and Concetta, whose property erupted with a vast array of delicious fruits and vegetables. They helped us enormously by contributing some of their bounty. That generosity enabled the creation of tasty, low-cost, nourishing foods, especially valued during the leaner years. Our community still bands together with food in support for one another. It’s not uncommon to see a neighbour walking around the street with a pot of soup, a lasagne or curry. When a new child arrives, if it’s suspected someone might be having a tough time, as community members are unwell or should someone seem over stretched or unable to prepare meals for themselves, we still share our food and nourish the neighbourhood. The internet has changed our notion of community. Having online access means the number of locals in our region that we can interact with is dramatically higher. Thanks to a heart-warming, innovative idea, neighbourhood food sharing practices occur on a much, much larger scale. Spare Meals Geelong is a Facebook page encouraging community food sharing. Just over a year ago, the group’s founder, Tina Taylor, noticed a huge range of “free stuff” online pages, where people with useful but unwanted items could give them away. She realised the same concept could be used for excess food. All too often clearing out the pantry, over ordering, making a meal fussy eaters refuse to touch or having an overly productive veggie garden, means good food ends up in the bin. Rather than having casserole five days in a row, Spare Meals Geelong shares it with any one in need. Spare Meals Geelong rehomes good unwanted ingredients and cooked meals so nourishing food isn’t wasted. The group of volunteers operate the page, which has almost 3600 members. Spare Meals Geelong eases the burden on other regional food support providers by giving local people doing it tough free emergency food support. Every week, volunteers create, source and share up to 500 meals through registered community kitchens and store food across distribution sites. There’s presently more than enough food to assist everyone who needs it. 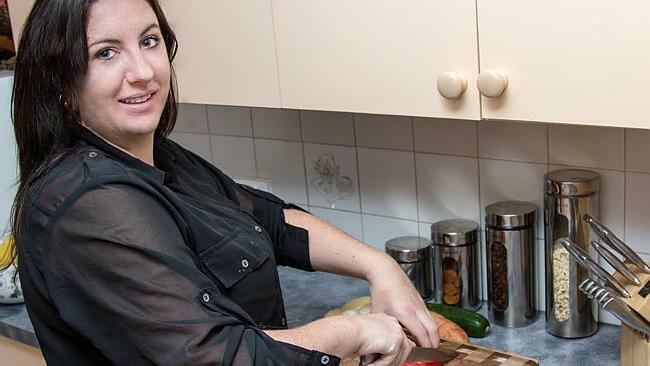 One of the Spare Meals Geelong Facebook site administrators, Kristy Cooper explained it works. 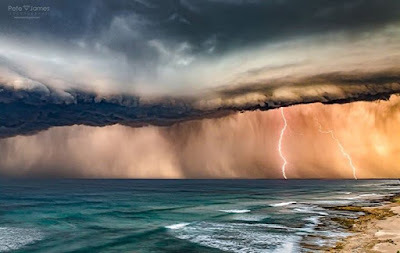 “We just look at it is as good old Aussie mateship. For anyone who could do with some assistance putting food onto their table. There’s no judgment and no need to explain your situation. You don’t need to provide concession entitlements, ID or meet any criteria,” she said. To get help, simply join the Spare Meals Geelong Facebook site and inbox an administrator. They’ll help arrange a time for you to collect your meals from one of the collection points dotted across Geelong. The service is a private, discreet and respectful way to receive assistance without judgment or embarrassment. Ms Cooper said that all Spare Meals Geelong asks for in return is that once the person’s situation improves they pay the favour forward and share some food with others in need. The biggest challenge Spare Meals Geelong faces is a shortage of containers to store and deliver meals. “To continue feeding our people in need, the group would really appreciate any freezer and microwave safe containers. Clear out your plastics cupboard and we’ll happily accept your excess containers,” Ms Cooper said. Rectangular take-away style containers are ideal, but any suitable containers, or financial contributions towards their purchase, would be greatly appreciated. For additional information or to contribute to Spare Meals Geelong’s outstanding work, please join their Facebook site. In a few weeks time I'm running a Writing Memoirs group for Seniors Week/Month and part of that will involve looking at photos of the past to trigger memory, such as this article about the Palais where all the young people used go dancing. ••GEELONG’s Palais theatre on Moorabool St hill was one of the city’s few live music ven­ues in the 1960s. Some would remember such names as singers Barry Crocker, Frankie Davidson and John Newman (not the footballer) who got their start there.But among the acts to appear at the Palais back then were the Allen Brothers, featuring none other than The Boy From Oz Peter Allen, whose life was also the subject of a miniseries Not the Boy Next Door which concluded on Sunday night on Channel 7. Singer Peter Allen with his partner Chris Bell. The Allen Brothers comprised Allen and his offsider Chris Bell, and they appeared back in the days when brothers Don and Laurie Slack ran the Palais. The Slacks sold it in 1972. The Palais Royal opened its doors in 1926 and some of the materials used in its construction came from the former Joy Ark dance hall which was built out over Corio Bay at Eastern Beach. The parquetry dance floor was said to have been one of the biggest in Australia. The Palais was also used as a cinema, but its boom years were from the 1940s to the 1970s. 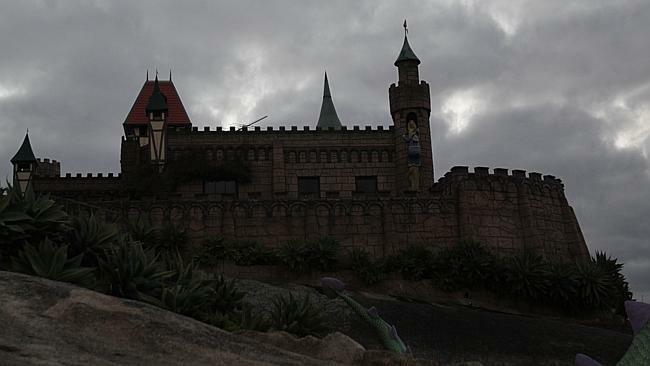 During World War II it attracted many Australian and American servicemen stat­ioned here and dances were held four nights a week. 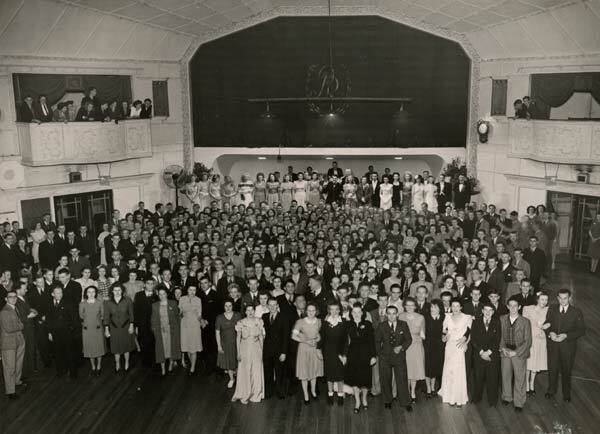 The late ’40s was the era of the big bands, and the Palais was the place to go in Geelong to hear bands playing covers of the big names such as Glenn Miller. The Max Taylor Big Band played at the Palais in the early 1960s, as did the Levis, who formed in 1962. Later came Grasshopper with Greg Bee on guitar and vocals. These days the parquetry holds tables lined up for bingo sessions, although there are plans to redevelop it into an entertainment complex with a theatre and function centre. 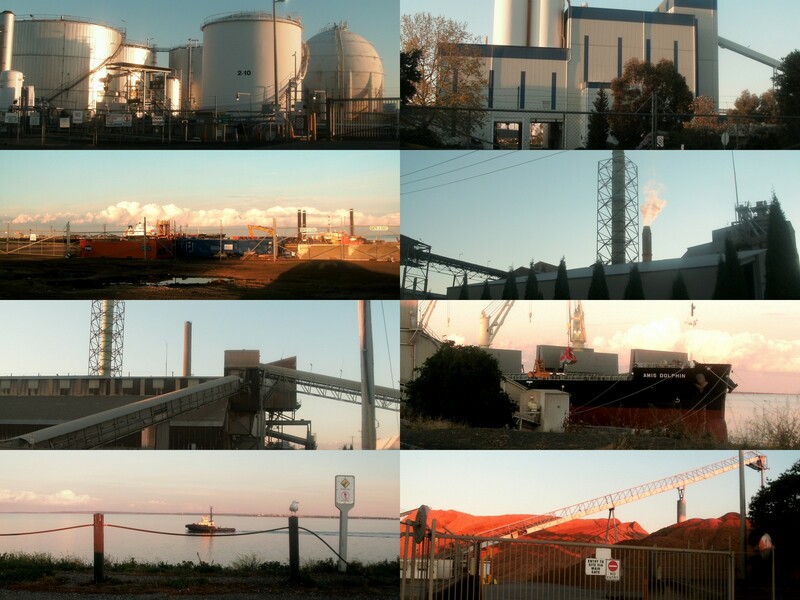 After a visit in Lara we drove back via North Shore which is 90% industrial with only a few streets of housing and a small beach. Of course there's an exclusive school in the area - separated by grassy fields of course - that's Geelong Grammar. Here are a few pictures I took this afternoon about the time of sunset. Someone had the initiative to spend a night out at Anakie at the Fairy Park to see if there were ghosts and scary things. But I think what's scarier is a huge silver Christmas tree stalking down Yarra Street to eat up the cars! Sometimes when we are returning from a supermarket in Newcomb we notice this tree with the twisted branches as we turn a corner. I had my camera today so took a photo. 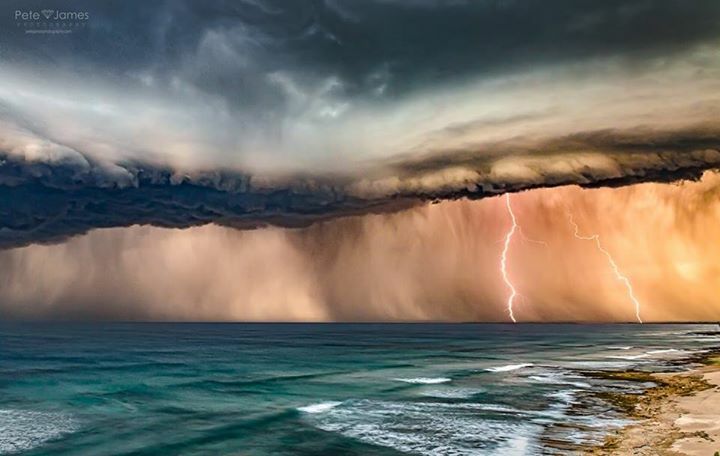 An Ocean Grove photographer captured this storm from a beach near Torquay on Monday this week. Amazing. Only photoshopped with 'contrast' and 'saturate'. Pete James. My grandson made a new little home for our two guinea pigs - Uncle Fuzzie and Darryn Jalesi out of a cake box which came with a birthday cake for a grand-daughter the other day. The guinea pigs have three houses within their puppy pen enclosure - one vegetable box on its side, an old cage with the door always open and now a little cake box. The photo is of Darryn Jalesi ready to eat breakfast. He's already had a go chewing the doorway. Geelong has upheld the view that migration to Australia is good and also that we welcome refugees to our city. Diversitat - formerly Geelong Migrant Resource Centre has been active for many years in assisting re-settlement. THIS city has a proud history of welcoming those from other countries. From the gold rush of the 1850s through the aftermath of World War II, the Cold War and over decades of global conflict, this city has opened its arms to people seeking a better life. 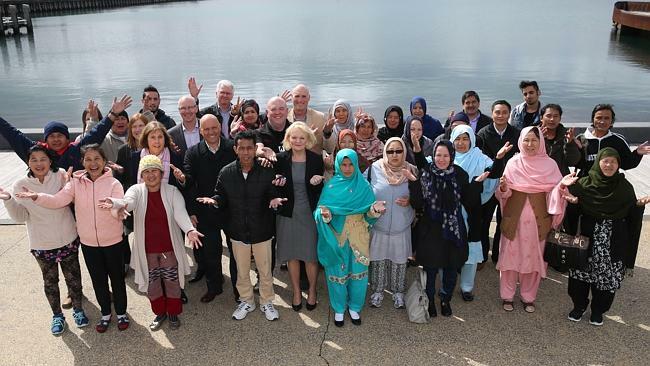 We have become home for migrants from so many countries, and each of these citizens has made Geelong a better place by making their homes here. They have infinitely enriched the quality of life here, giving us the best of their countries as they became citizens of ours. Now it is time again to open our arms to those from another country. It is time for us to open our arms to those fleeing the awful war in Syria. As all of us know there is a crisis happening in the Middle East. A nation is being displaced. Good people are being forced to walk away from their country to save their own lives. Every day we are faced with the images of death and profound desperation as a nation is dismantled before our eyes and hundreds of thousands of people are displaced from their homes. There is little we can do to stop what is happening in Syria. But there is something we can do to make a difference. Today our community leaders are telling the Federal Government that Geelong has the infrastructure and support services needed to immediately accommodate scores of displaced refugees. But, most importantly, we also have the heart. We as a city can open up our arms and welcome some of these desperate people to our city. We can give them the same opportunity we have given migrants for more than a century. We can give them a chance. And today we are saying as a city let’s open our doors to these poor souls. from w. On Friday morning some of us from East Geelong Uniting went to Whittington Primary School for their assembly at which the string music students performed many items. Over the past two years they have been learning mainly the violin and cello - about 25 of them - thanks to gifts and grants organised by our minister Rev IKani from our church. The intention is to provide an opportunity for students who live in a suburb which has several disadvantages to to something really creative such as learning stringed instruments and playing together. It was a lovely morning and then we had a cuppa with the Principal and music teachers who come in on Friday mornings to teach. For Fathers Day the lads decided we should do a family thing - all of us go to ten-pin bowling at 3 p.m. Eight of us, and two other families who are good friends. I watched - didn't want to trip over my walking stick which I need in this cold weather. Peceli had a go though. They all got excited when they knocked all of the bowls over. A good afternoon had by all. This morning during morning tea after worship at East we sang Happy Birthday to Brendon who is now fifty. Our grand-daughter, made the special chocolate cake. Way to go Linlay! Our local happy chappy - sometimes - mayor is not happy, not happy at all - about that blessed bling tree. 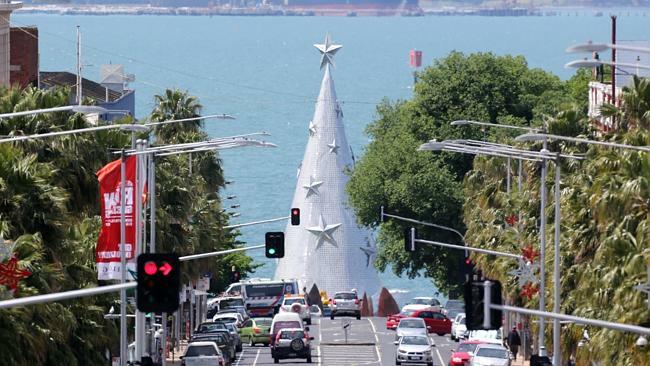 · GEELONG Mayor Darryn Lyons believes the city’s entire Christmas program is in jeopardy as councillors plot against him and his floating tree. Cr Lyons last night told the Geelong Advertiser the Christmas tree was “in the danger zone”, with councillors deliberately stalling on deliberations in a bid to kill Christmas and hurt him personally. Cr Lyon’s extraordinary spray follows news this week the City of Melbourne will spend $4 million on a Christmas program which includes a new Lego Christmas tree in Federation Square, flashy new decorations and Christmas bells in Birrarung Marr, in a bid to become the country’s Christmas capital. The Geelong Mayor said he wanted to see the content of the recent confidential council debate about the fut­ure of the floating Christmas tree made public so Geelong ratepayers could see what went on behind closed doors at City Hall. 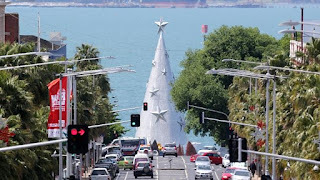 Following the success of the floating Christmas tree last year, he had hoped to make it 6m taller this year and provide a more impressive nightly light show, Cr Lyons said. He had also planned to invite every school in the region to the lighting of the Christmas event, with one school given a golden ticket to flick the switch.